Spring at the Abbey teems with life, and we can’t help but smile at the sight of mommy turkeys, with more than 20 baby turkeys in tow, wandering happily on our grounds. With an abundance of rainfall—including a thunderstorm that downed trees on Country Lane—the landscape is green and lush. Some of the areas around Tara’s Refuge feel like sacred spaces—see them here. 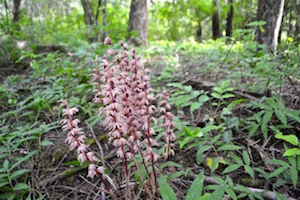 Enjoy the glorious Spring photos and check out our full summer schedule. Our doors are open for you! 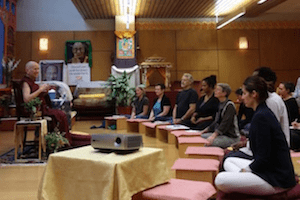 We were honored to host Dagri Rinpoche for an eight-day course, during which he taught on Je Tsongkhapa’s “Praise to Dependent Arising” and gave the jenangs (initiations) of both Amitabha and White Tara. Rinpoche has a great sense of humor and wove many stories—from his life as well as Jataka tales—into the teachings. Damchoe from Boston did a fantastic job translating from Tibetan into English. 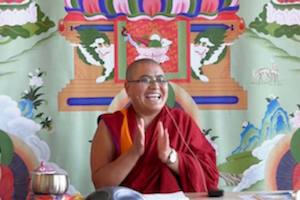 Watch Dagri Rinpoche’s talks here. 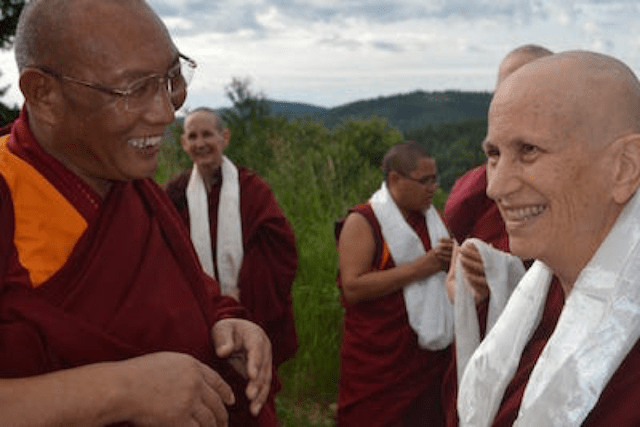 There was a very intimate feeling in the group of students, some of whom came from far away for the course, and Rinpoche’s compassionate presence had a strong effect on us all. It was a good cross-cultural experience both for Rinpoche and students who haven’t been to India. The latter had the experience of learning by hearing an oral translation of the teachings, and Rinpoche experienced recitations chanted in English. Ven. 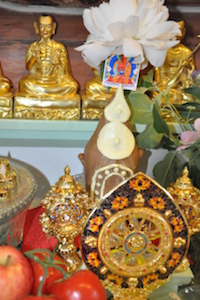 Chodron reflects on the retreat experience on Bodhisattva’s Breakfast Corner. We’re delighted that he agreed to return next year. See course photos here. Geshe Tenzin Lhadron from Jamyang Choling Nunnery in Dharamsala visited the Abbey for almost a week. In December 2016, at Drepung Monastery in Mundgod, India, His Holiness the Dalai Lama led the convocation ceremony for the first female geshes ever in Tibetan history, and Geshe Lhadron was one of them. She and Ven. 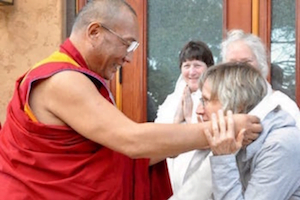 Chodron are old friends, so when Geshela was taking a summer course at University of California, Irvine to improve her English, she was able to take a side trip up the Abbey. Geshe Lhadron gave three talks: a lively one on debate, one telling her life story, and the last one on love and compassion. Wanting to experience life in a Western monastery, Geshela joined in all the Abbey’s activities—meditation, teachings, chanting, posadha, and even working in the forest. Her visit was a pleasure for all of us! photos are here. Ven. Chodron taught at Maitripa College, Portland, about Nagarjuna’s perspective on good governance as presented in his 500-verse poem, A Precious Garland of Advice for a King . Her talks were based on Khensur Jampa Tegchok’s commentary on this text, which she edited into the book, Practical Ethics and Profound Emptiness . The topic easily lead to a comparison with the present situation in the USA, and the audience asked heartfelt questions about how to overcome discouragement and a sense of hopelessness. Ven. Chodron energetically explained why now is a wonderful time to practice the Dharma and why hopelessness is not an option for those who admire bodhicitta. Watch the teachings here and here. After the teachings, Ven. Chodron spoke at the 2017 Maitripa College Commencement ceremony, rejoicing in the achievements of their 9th batch of graduates. She shares about her lovely weekend at Maitripa College in a Bodhisattva’s Breakfast Corner talk. While Ven. 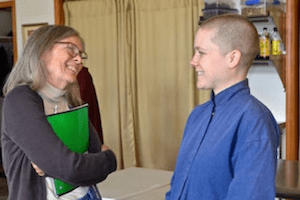 Chodron was teaching at Maitripa, the Abbey community had an activity-filled weekend with Offering Service Saturday followed by Sharing the Dharma Day. An enthusiastic crew worked double-time in the forest, while others harvested the veggie garden and helped in the kitchen. See photos of everyone’s joyous efforts here. The next day, Sharing the Dharma Day, saw a good-sized group from the Spokane Unitarian Universalist Church coming to the Abbey, some of whom were visiting for the first time after attending the Monday meditation group run by our nuns. We really enjoyed showing them our home after connecting weekly at the Spokane UU for years. Ven. Jigme gave a heartfelt talk on nourishing our good qualities based on the introduction to An Open-Hearted Life by Ven. Chodron and Dr. Russell Kolts, followed by a discussion where people shared ways to keep compassion alive in our daily lives. Watch Ven. Jigme’s talk here. Ven. 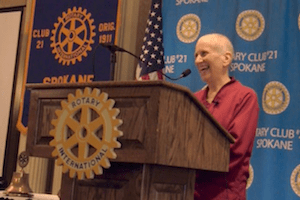 Chodron spoke on “Peace Practices: Changing the World from the Inside Out” at the Rotary 21 Club in Spokane. Impressed with Rotary’s Code of Conduct, she reflected upon the Rotarians’ aspirations to: (1) act with integrity and high ethical standards in their personal and professional life; (2) deal fairly with others and treat them and their occupations with respect; and (3) use their professional skills through Rotary to mentor young people, help those with special needs, and improve people’s quality of life in their community and in the world. Ven. Chodron was also moved by Rotarians saying, “We refuse to accept conflict as a way of life,” and emphasized the importance of becoming a peaceful person ourselves and then working to lessen aggression and respect and increase people’s awareness of our interdependence to create peace. Watch the talk here. One by one, leaders of Spokane churches shared openly about their own journeys to accept and embrace their LGBTQ friends, colleagues, and congregants. 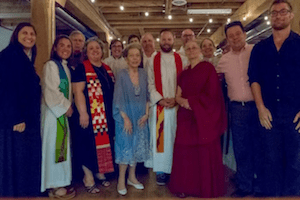 Their stories were frank, touching, and inspiring, and the message was clear: every presenting faith leader wanted LGBTQ people to know they could find a safe spiritual home inside that church or temple’s walls. Enthused by the open-heartedness of all who attended, the Interfaith Pride team promised to repeat the service next year. Work on Prajna House, a small residence for Ven. Chodron and all future abbesses (or abbots) is coming along. Dagri Rinpoche kindly blessed the building site, dedicating strong prayers for the Dharma to flourish. See photos of the Prajna House blessing and read about it here. The footings were poured a couple of weeks ago and the concrete for the stem walls and the back wall was just successfully poured. The packages of faswall, a green building material with high insulation value, have arrived. After the water pipes, radon protection, plumbing, and other underground things are put in and the slab is poured, the walls will be built using the faswall blocks. Ven. Samten is making videos of the construction. Watch the first one here and see photos of the building progress here. We are very touched by all the support that is coming in so that Ven. Chodron can live in a building with running water (unlike her present cabin—as much as she loves staying there). 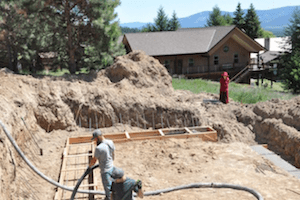 Friends of Sravasti Abbey is hoping to meet the $100,000 matching grant by August 1. You can make your offering here. An extract will be in the Wall Street Journal! His Holiness the Dalai Lama and Ven. Chodron have been working for many years on a multi-volume series entitled The Library of Wisdom and Compassion, which presents the Dalai Lama’s comprehensive explanation of the Buddhist path in English. At last, the first volume, Approaching the Buddhist Path, is ready, and we are excited about its release. 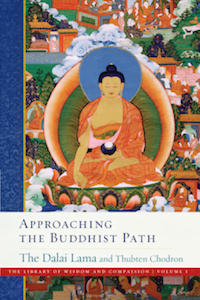 Approaching the Buddhist Path will be published in August. Pre-order it here and read the review in Publishers Weekly. The Wall Street Journal will publish an extract from Approaching the Buddhist Path as an op-ed article by His Holiness on July 7. Keep your eyes open for that! Vens. Losang and Pende, Hsiao Yin, and Christina traveled to Maitripa College to receive teachings and the Vajrasattva empowerment from eminent Tibetan teacher Jangtse Choje Rinpoche, who will become the head of the Gelug lineage in August 2017. They joined nearly one hundred people at the event, and were warmly welcomed by Maitripa College President Yangsi Rinpoche and staff. The talks and empowerment concluded with a Guru Puja, where Vens. 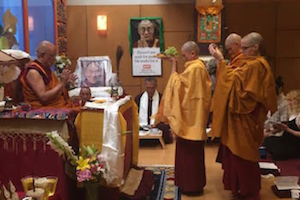 Losang and Pende had the honor of presenting the offering plate to Rinpoche. The group deeply appreciated the hospitality of their Portland hosts and friends of the Abbey who offered meals. They returned from the trip enriched by the Dharma and the kindness of others. Watch Ven. Losang’s sharing about the teachings at Maitripa. Photos are here. Since 2012, Sravasti Abbey has offered people the opportunity to join the Abbey’s daily life as a WWOOF volunteer. WWOOF stands for World Wide Opportunities on Organic Farms and communities. 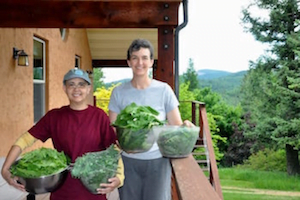 “WWOOF-ing” at the Abbey is a great opportunity to learn about organic gardening, forest and meadow health, and living in intentional community, as well as learning about Buddhism. As a WWOOF volunteer you will help in the forest, the veggie and flower gardens, the orchard, and more. Participants may join the spiritual program at the Abbey if they wish. You will offer service with Abbey residents and guests 6 hours a day, 6 days a week, and may stay for 1 to 3 weeks. The length of your stay can be extended. We provide food, lodging, and plenty of opportunities to learn and to experience community life. Learn more about this program on the WWOOF website and apply via email. To our Spanish speaking friends: the Spanish translation of An Open-Hearted Life is now available! This book was written by Ven. Chodron and Dr. Russell Kolts, a clinical psychologist. Written for a secular audience, it talks about how to cultivate compassion from both a Buddhist and a scientific/psychological perspective. Tibetan and Himalayan nuns in India are now learning science through the Emory-Tibet Science Initiative, and they love it! Small actions can bring big results. Read about the ripple effect of a chance encounter and some small acts of kindness. Ven. Jampa shared her thoughts on the benefits of living with a community in a monastery. Our local newspaper, the Newport Miner, did a feature story about the Abbey in their special publication on area churches. Chelsea and KC from Singapore made a special trip to the Abbey while visiting the USA; friends from Mongolia also visited, as did people from around the US, including an enthusiastic group of students from a psychology club at Eastern Washington. We were delighted to welcome them and hope more of our international and national friends will come to visit. A team of 13 volunteers worked for almost a year to standardize and improve on the titles and descriptions of videos on the Sravasti Abbey YouTube channel. Team leaders Ramesh and Janet helped to update more than 3,000 entries on the web, completing the project last month. We are so grateful to the international team for their dedication to making our YouTube channel more search-engine friendly!